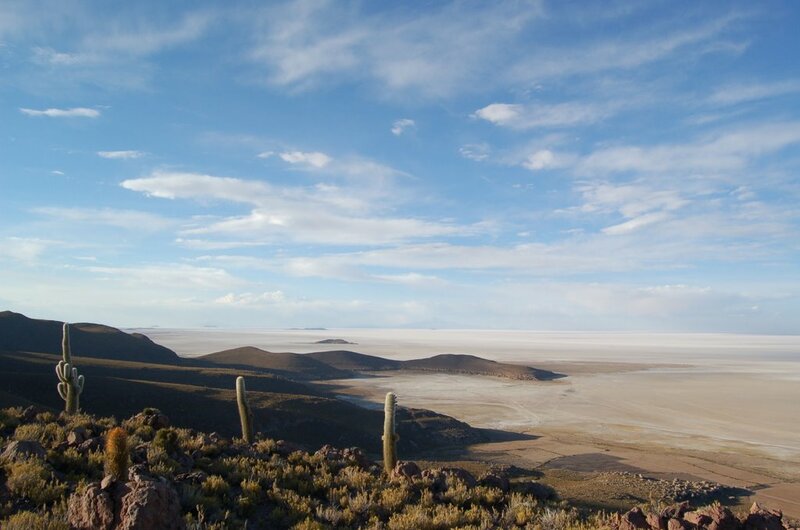 With Chile so close and Bolivia lacking its own coastline, minerals have long been exported by rail from a huge mine east of Uyuni to the Pacific. 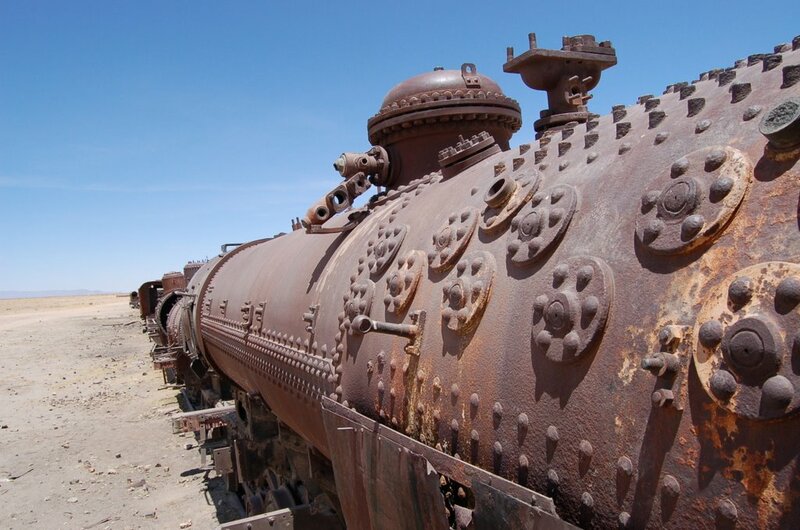 Outside town, in the “Train Cemetery”, we looked at the rusting carcasses of steam trains, dumped in the late 70s when diesel locomotives took over. A wit had daubed graffitti on one: “Wanted – mechanic with experience”. We took the obligatory photos and Chriso, our driver, joined the convoy of other Land Cruisers to the village of Colchani. 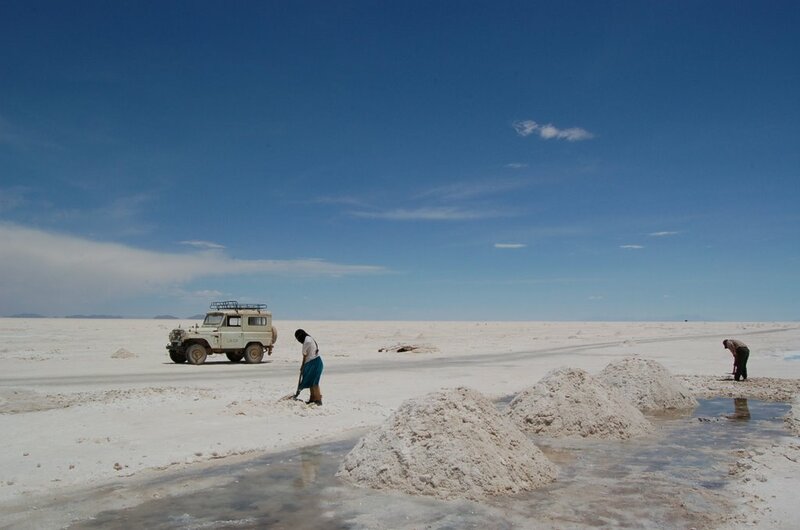 Located on the edge of the Salar, the villagers spend 8 hours a day collecting salt which is then dried over a wood fire, crushed and, after iodine has been added to prevent thyroid problems, bagged by hand. At 50p for 25 kg, the margins are tight and a day’s pay for a salt worker is less than 2 pounds. 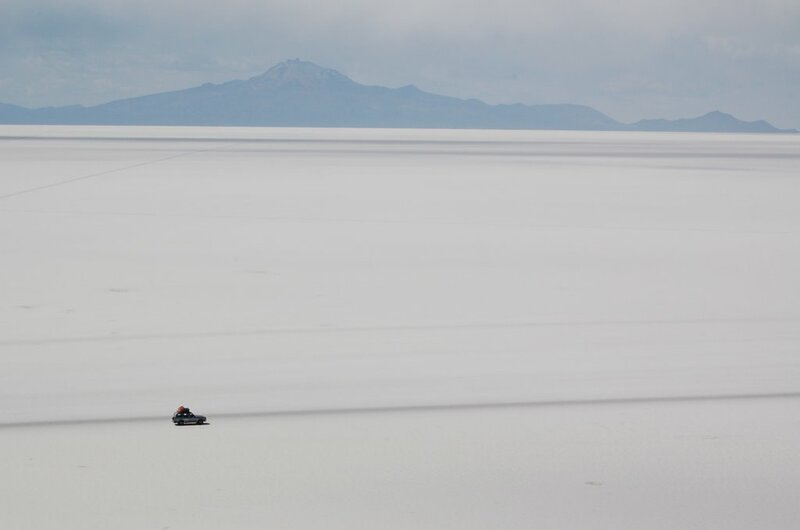 The Salar, formed by the evaporation of a huge lake into which minerals from the surrounding mountains had leached, covers 12,000 square kilometres and contains 64,000 million tonnes of salt which is up to 12 metres thick in places. Put simply, it is stunningly white. Dazzling. Without sun glasses, you would become salt blind. Two dark lines, the rubber of a thousand Land Cruisers, marked the route and the tyres hummed on the hard surface as we headed to the island of Inca Huasi in the middle of the Salar. 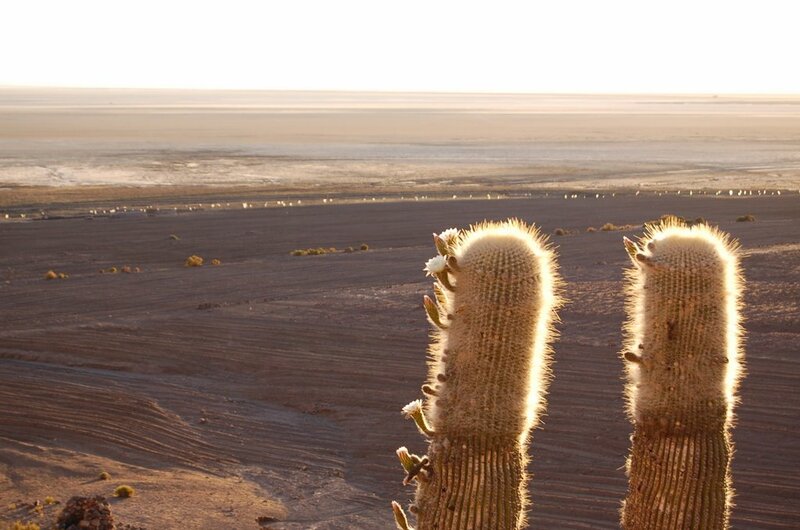 Covered in ancient cacti, the views over the salt pan were incredible. An immense blankness, edged by the shadows of distant volanoes, which defied scale and hypnotised us with its lack of reference points. After lunch of roasted meat and salad, we drove south and stopped in a small lodging perched on the hillside overlooking the Salar. Built entirely of salt (walls, furniture, beds and floors), it was basic, but cosy and, with earplugs against a group of Irish, I slept soundly. On the second day, we crossed the railway line and climbed on rocky tracks into a volcanic landscape of fractured lava, vast brown fields of pumice and conical peaks. At the fourth of a series of shallow, salty lakes, we stopped for lunch. Deep pink-coloured flamingos strutted in the water, moving serenely out of reach as the tourists tried to photograph them. It would have been good to have stayed, but the convoy had to roll on and we passed huge rocks carved into surreal shapes by the wind. 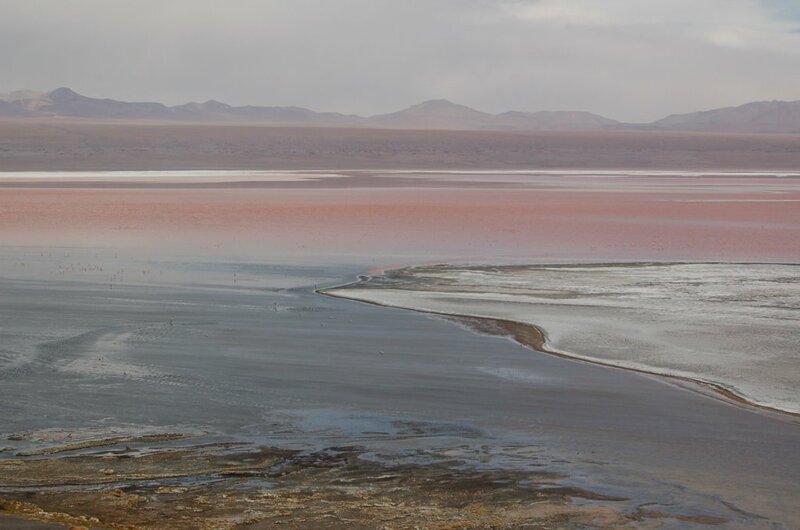 In late afternoon, we reached Laguna Colorada, a vast lake with islands of white salt and borax, flocks of hundreds of flamingos and water stained read by algae. A wind was howling and the lake felt primordial in the fading daylight. 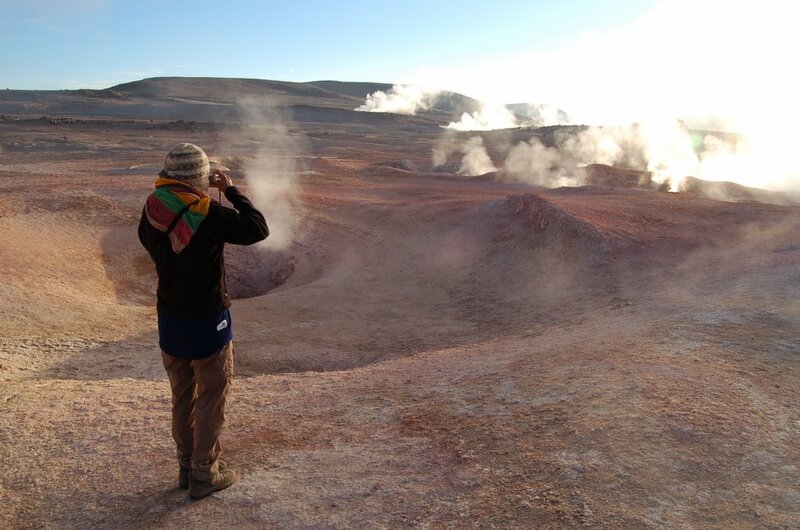 We rose the next day at 5am in the darkness to reach the Sol y Manana geysers at dawn. Backlit by the warm morning sun, the clouds of steam were beautifully golden and the landscape a rich yellow. Craters bubbled with grey mud, holes hissed with gas and a sulphurous smell filled the air. The entire region was active and, a few kilometres away, we soaked in natural hot spring while Chriso prepared cake and mugs of sweet, hot chocolate. It was lovely to wash off the grime, dust and sweat of two days on the road. 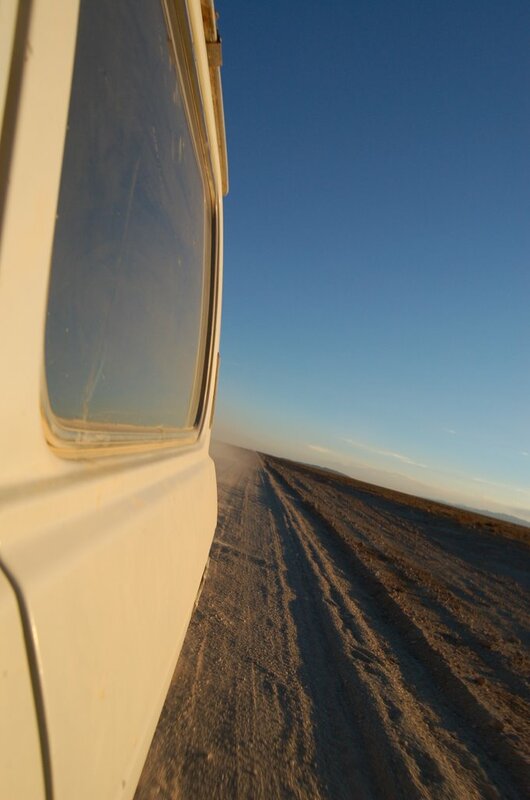 We dropped the French at the Chilean border and, with the Land Cruiser almost spacious, we headed north for the seven hour journey to Uyuni. The landscape was brutal and barren with only the odd adobe village and herds of llamas giving any clue to human existence. I wanted to store it all in my mind because soon enough we would be back in the bustling madness of La Paz.